The GlobusWorld Tour is coming to the UK! The Science and Technology Facilities Council's Rutherford Appleton Laboratory is hosting a day-long GlobusWorld Tour of workshops on Thursday, January 10. Get details or register here. Time: 9:50 a.m. - 5:00 p.m.
Register now or visit the STFC Rutherford Appleton Program page for more information. 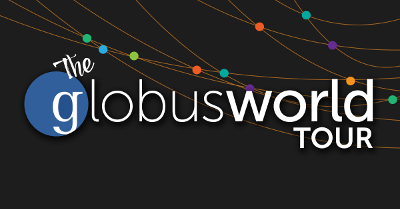 GlobusWorld Tours are a series of Globus tutorials and developer workshops across the US, showing the research community how to leverage the Globus platform to build applications and accelerate their research through automation. Workshops are free to attend but we require registration to facilitate planning. For more information, visit the GlobusWorld Tour site.